Is Diabetes Genetic? Many people who suffer from diabetes understandably worry that their children will therefore have it, although the reality is not quite as simple as that. Diabetes itself is not hereditary; although the risk factors that a person has are passed down through the genes, therefore making it more likely that the next generation will have it. An estimated 80% of those diagnosed with diabetes each year have at least one family member who already has diabetes. A family history of diabetes is only one of the risk factors; other risk factors include having a blood sugar level of more than 200 soon after eating, having high triglycerides, smoking and low HDL (good) cholesterol. In general, in the United States, one in every three people will at some point in their lives suffer from diabetes, with women being more susceptible than men. And it’s estimated that by 2025, around 300 million people worldwide will suffer from diabetes. It can be difficult to determine if you are going to get type 2 diabetes due to a family history of diabetes, as most people don’t develop any symptoms until middle age. Less than 1% of the population develops juvenile diabetes, while it is far more likely to affect people who are over 40 years old and who are also overweight or smoke, although in recent years it has begun to affect younger people more. The chances of being diagnosed with either type 1 or type 2 diabetes are also different, depending on various risk factors. Type 1 diabetes is most common in younger people and around 90% of children diagnosed with type 1 diabetes have no family member or relative with the disease. To some extent, it is possible to determine at birth whether a baby has some of the genes associated with risk factors. The chances of getting type 2 diabetes depends more on environmental factors – if you have a family history of diabetes, it will increase your chances of getting it, but only if you lead an unhealthy lifestyle with a poor diet and little or no exercise. And there is also some evidence that children are more likely to develop type 2 diabetes if the mother is diabetic, rather than the father. 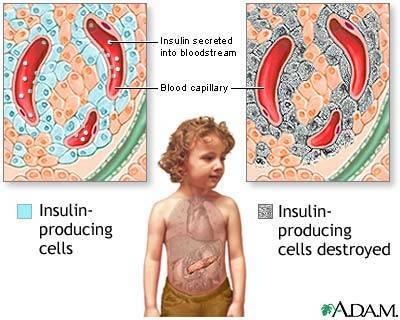 If both parents are diabetic, the chances of a child developing it are even higher. One thing that we have no control over is the aging process and unfortunately, as we get older we have an increased chance of getting diabetes. People aged 45 or over face an increased risk; and people over 65 in particular – around 20% of Americans over 65 have some form of diabetes. Race is also a risk factor – statistically, African Americans and American Indians are more likely to develop diabetes. As we age, it becomes even more important to minimize the risk factors that we do have control over, such as diet and exercise.